Aero "Evolve" for Tevo Tornado,Flash/ Creality CR10,s,Ender3/ Prusa Mk3 by dpetsel is licensed under the Creative Commons - Attribution - Non-Commercial - No Derivatives license. Nice installation video made by Youtube user "3d-Hobby"
We have engineered a cooling mod that is taking the Titan Aero to the next level. We call this the Evolve. As with all our mods, we developed this using enhanced CFD simulations and incorporating features that have proven successful from our popular Petsfang v2 and Bullseye designs. With over 400 hours of testing on 3 different platforms we are ready to offer this to the public. 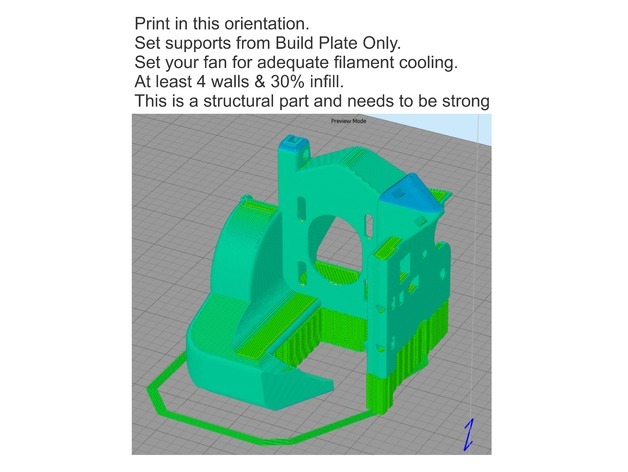 Some of the features setting this apart are a one piece mount/duct for the Titan Aero that accommodates both the E3Dv6 and the Volcano heat block in the same print. We solve this with elongated mounting holes, in the base, for either heat block. This keeps the whole part very solid and allows for a very tight, vibration free mount to the back plate. 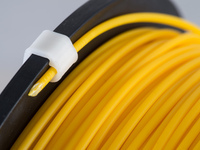 Our new duct outlet profile provides greater coverage of the filament and has a 50% longer dwell time over the filament for cooling, allowing for increased overhang performance at higher extrusion volumes. With the increased velocity we have added segmented outlets extending into the plenum to reduce high pressure areas within the duct outlet giving a more balanced flow across the outlet. Most of our testing was .3mm layer heights with a .6mm nozzle. The CFD simulations allowed us to optimize the outlet velocity to keep a greater distance from the nozzle and allowing for a smaller plenum. This still allowed the converging airflow to exit to the back of the build pate which has proven to be very successful with all the Petsfang mods, keeping fresh air and lower turbulence on the filament. Have all your nuts installed and verify they are centered on their locating holes before you start the assembly. Make sure to start with the screw behind the Heat Sink mounting area. This will hold the motor in place while you mount the heat sink and the Titan heat sink cover. Keep that screw just tight enough to allow vertical movement of the assembly. You will need this for height adjustment once you get all the screws installed. Move the Titan extruder to its highest position to install the heat sink / hot end. Once in, you can adjust the assembly down to the final position and tighten the screws. Duct should be set as high as you can get it and still clear the heat block insulation. Typical clearance of the duct bottom is 2.5 - 4 mm from your build plate when the nozzle is touching the build plate. The airflow is not perpendicular, but angled roughly 10 degrees down from the outlet. Keep this in mind when you are mounting the Aero to the duct to get the best performance. 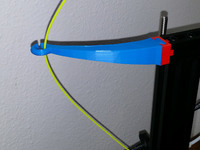 The wires to your extruder motor will be too short with this mod. If you are using a third party "pancake" motor a wire harness is usually provided and can be soldered in place with the extra length. If you are using the stock motor you will have to purchase an extension wire harness that will need to be measured and soldered into place. 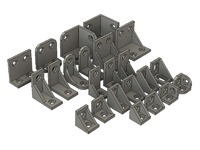 The offsets for the optional ABL mounts are referenced in the file names of those parts. (2) m3x10 or 12 Left screws to back plate. (2) m3 nuts. Square or hex. (1) m3x5 with washer. Attaches to pressed in nut where original extruder mounted. Optional.